Starring: Al Pacino, Sean Penn, Penelope Ann Miller, John Leguizamo, Luis Guzman, Ingrid Rogers, James Rebhorn, Joseph Siravo, Richard Foronjy, Frank Minucci, Adrian Pasdar, Jorge Purcel, John Ortiz, Rick Aviles, Brian Tarantina, Jon Seda, Marc Anthony, Paul Mazursky, Viggo Mortensen. 10 years after they first collaborated and brought Tony Montana to the screen in “Scarface”, Brian DePalma and Al Pacino team up again for yet another foray into the crime world. Puerto-Rican drug dealer Carlito Brigante (Pacino) has just been released from prison due to some diligent defending from his trusted lawyer and friend Davie Kleinfeld (Sean Penn). Upon his release, he is immediately back in contact with his old cohorts from the streets and recieves several offers to get him back in business, but Carlito is determined to go straight and make a better life for himself and his girlfriend Gail (Penelope Ann Miller). The problem is, he needs money to escape the life of crime so agrees to run a nightclub for as long as it takes to earn his money and move on. However, as much as he’s finished with his previous life, his previous life is not finished with him as old and new faces appear, testing his resolve. 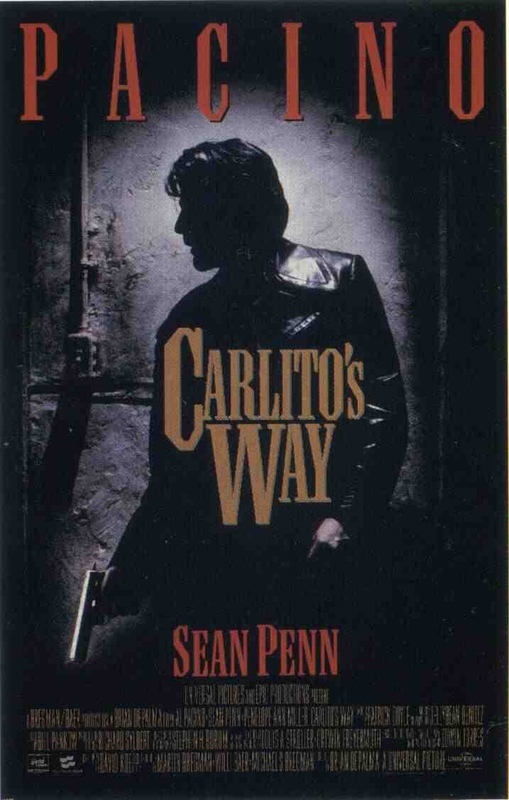 DePalma’s “Scarface” has a proud and faithful following but with “Carlito’s Way” he has outdone himself. There are some similarities with both films and Brigante could also be seen as an aging Montana but the reason it works better this time around is the investment we have with Carlito. He is a more human and sympathetic character and we want to see him succeed. Pacino also underplays it this time with a lot more subtlety and a lot less grandstanding, immediately winning us over. There is also some brilliant support from Sean Penn who oozes sleaze and due to his spiralling cocaine habit is more of a danger than a help to Carlito. John Leguizamo is also a standout as Benny Blanco “from the Bronx”, a young but dangerous hood out to make a name for himself and a short but powerful appearance from Viggo Mortensen as a strung out disabled addict, who also has his own interests at heart. Fine performances all round and effortlessly handled by DePalma who’s also not adverse to showing us some flamboyant and skillful camerawork during some tense and exciting action set-pieces. Although it may not be as “epic” as some other crime films, it without doubt deserves to be considered as equal to the best in the genre and stands as DePalma’s best film so far. This entry was posted on January 17, 2012 at 12:43 pm and is filed under Crime, Drama, thriller with tags 1993. You can follow any responses to this entry through the RSS 2.0 feed. You can leave a response, or trackback from your own site.